Blogging has played an important role in the Manaiakalani pedagogy for over ten years now and a generation of young people have been through our schools knowing that sharing your learning publicly is an important part of the learning process. Many of our learners have chosen to continuing sharing on their blogs during the school holidays and I have written posts like this sharing anecdotal observations about their holiday writing. Writing is a social activity for many people and our learners are encouraged when someone interacts with their post and they see on their feeds that people have viewed their blog. Over the 2015/16 summer holidays the Woolf Fisher research team set up a project to encourage more of our young people to blog during the long summer break to observe whether this was in fact a valid way to arrest the frustrating 'summer drop-off' that so many of our priority learners experience. This was led by Rachel Williamson. 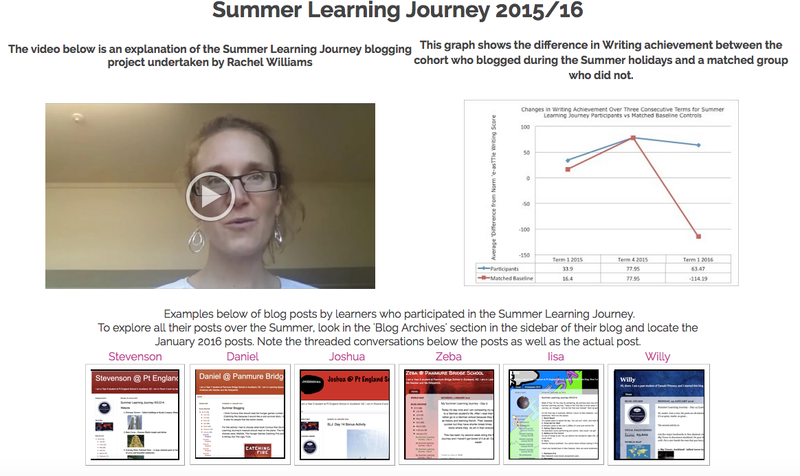 Rachel constructed the Summer Learning Journey using the Manaiakalani pedagogy and the young people had multiple opportunities to Learn, Create and Share as they explored the world virtually. A full description of the programme and the outcomes can be seen on this page on the Manaiakalani website. The first one is a highly valued outcome in our Manaiakalani schools. 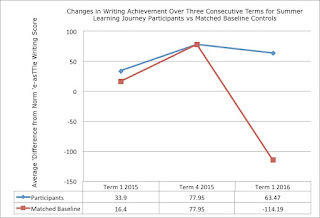 The learners who participated in the blogging programme did not experience a significant drop off in their test scores as measured by the e-asttle writing test. The blue line on the graph shows the summer bloggers test scores over the course of a calendar year. 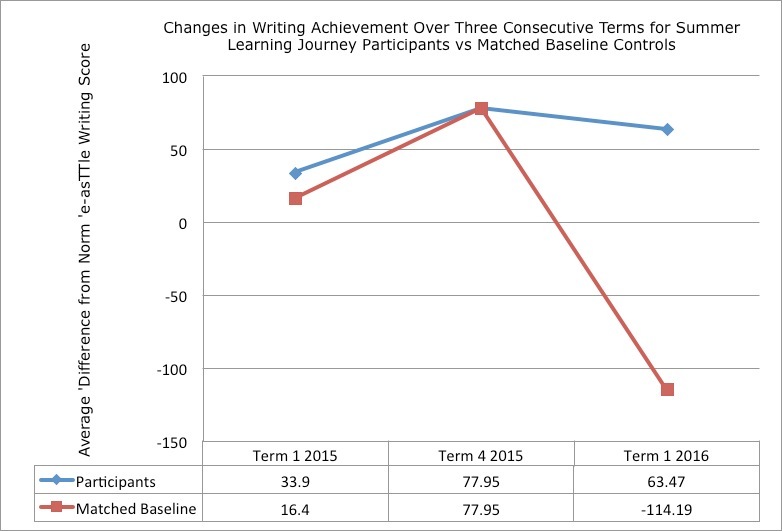 The red line shows a matched sample of learners who did not blog over the summer (matching gender, ethnicity and achievement level) and displays the trend we are familiar with - writing outcomes rise during the school year and take a deep slide over the summer break. The second observation is an outcome that is valued by some people who question us about 'WHY' we 'LET' our young people share their learning prolifically online. These adults express concern that the writing might not be perfect, and imperfect surface features may even reflect negatively on the child, the family or the school. 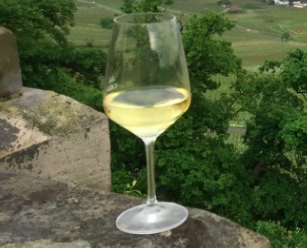 Glass is half full people!! Rachel analysed the surface features of the writing shared online during the summer break - presumably completed with little direct adult support - and came up with surprising results that should reassure people whose inclination is to micro-manage children's published writing. Accuracy was measured using four indicators: Percentage of words spelled correctly, percentage of word sequences that were correct, percentage of punctuation marks that were used correctly, and percentage of sentences that were complete and correct. In each case the percentage score was calculated as: Number of correct examples/total number. On average, 77.1 % of punctuation marks in each post were used correctly. On average, 73.6% of sentences in each post were complete and accurate. We highly recommend you read the report yourself. Manaiakalani from KPE TV on Vimeo. You usually get what you expect .. arguing for clarity.